Just for Star Trek ladies! Women of Star Fleet will love the design of this Star Trek Original Series Ladies Wallet! With room for a checkbook, credit cards, spare change, and Command Deck access card, it's not only stylish but super handy, too. The tri-fold faux leather wallet features a snap closure, applique, embroidery, and foil deboss artwork on the front, slots for cards, an ID window, checkbook and money pockets, and a back zipper pocket with a deboss gold foil Star Trek logo patch. 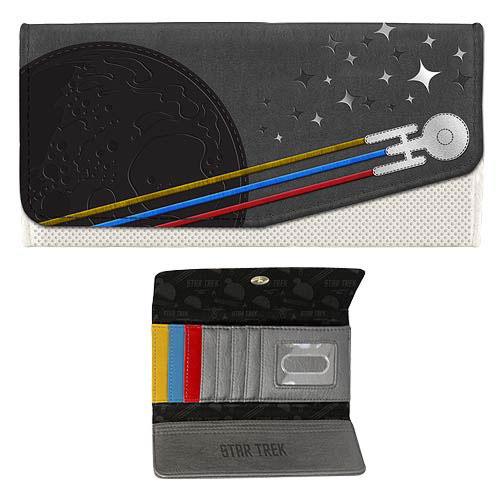 The Star Trek Original Series Ladies Wallet measures 8-inches wide x 4-inches tall. Ages 14 and up.